When you are having discussions about getting a new website, there is usually some mention of a content management system, or CMS. While not 100% of websites must have a CMS, it is very rare that that feature is left out. Basically a content management system gives you the control to manage the content, photos, files, pages, etc. that is on your website. Most CMS platforms include what is referred to as a WYSIWYG editor, which stands for What You See Is What You Get. With a WYSIWYG editor there is usually little to no HTML knowledge required so you can manage website content similar to editing a Word Document. In most systems you can have 1 users or multiple users and in more advanced systems you can limit editing capabilities by the user. To keep it simple...it makes it so you can change pictures and text on your website. Does the CMS give you the ability to create as many pages as you want? It should. You don't want to have to rely on someone to create these pages for you. Does the CMS give you the ability to manage important on-page SEO (search engine optimization) elements such as Page Titles, File Names, META descriptions, Headings, alt text, etc? The CMS you choose should allow you to control these items with minimal complications. Is the CMS itself built with SEO best practices in mind? You probably won't know this, but it's worth asking the developer. Is the editing functionality handled from a back-end admin section or a front-facing website editor? There is not necessarily a right or wrong here, it is somewhat a matter of preference. We have heard many website managers frustrations with back-end systems which is why ours is completely front facing but some people have no problems with with back-end editors such as Wordpress or Joomla. Is the CMS open source or proprietary? This means that the code is either open and available to everyone for free, or the CMS was built by a single company. There are pros and cons to both, just be sure to have this discussion with the developer. If the system is proprietary, what are the restrictions, fees, etc. associated with the system? Is the CMS flexible enough for you to create landing pages? If you have been reading our blog or most other blogs in this industry you are most likely aware that landing pages are important. Even some of the better CMS platforms don't allow you to easily create landing pages! Most content management systems are web based. Meaning you do not have to have a piece of software on your machine (other than a web browser) to edit the content. A web based CMS is the ideal solution in most cases. This should give you enough information to create further discussion in your website re-design or re-development process. 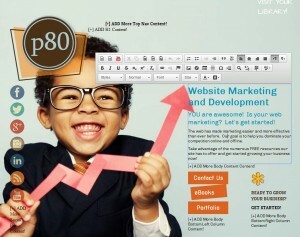 Want to learn more about our CMS, c80? Check out these videos.